The warm weather can make us impulsive. But before you pack the car and head for wine country, remember these tips to make your trip more pleasant. 1. Bring a designated driver - It isn’t worth it not to. 2. Be picky - Don’t try everything in the tasting room; your palate will be confused and you will wind up not liking anything. Besides, this is a great opportunity to try products you can’t get on the shelves at your local store or something a little different from your usual. 3. Eat - Make one of the local restaurants part of the day. There are lots to choose from and the wineries will suggest their favorites. 4. Call ahead - Wineries are seasonal businesses. Call to confirm their hours of operation - even if they have a website. 5. Large groups - Most wineries are small operations. If you have a group of 8 or more, let the winery know you will be stopping in, the service will be much better because they will be prepared. 7. Ask questions - This is your chance to learn first hand about winemaking and specific wines. The winery personnel should know the answers - most of them are the winemakers themselves! 8. Ask for a tour - If the winery doesn’t offer a tour outright, ask if you can walk through the vineyards or if there is someone to show you around, they might just say yes. 9. Make a plan - If you aren’t following one of the Trails, make a plan and add in some of the area’s other attractions. You don’t want to miss any of the scenery or waste your day figuring out where to do or what to do. 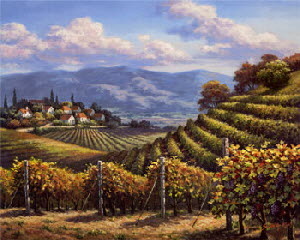 You want to relax and enjoy Wine Country. 10. Have fun - Leave your troubles at home and remember to bring back a case or two of memories.